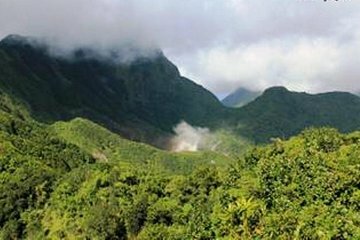 Explore the Morne Trois Pitons National Park, a UNESCO World Heritage Site, with a guide on this full-day trip in Dominica. Let a guide lead the way and take care of navigation while you soak in the scenery while trekking through the park, including the Valley of Desolation, Ti Tou Gorge, and Boiling Lake. Listen to insightful commentary on the indigenous flora and fauna of the region, learning much more about the island's environment than you would exploring on your own. First of all, I want to thank Simon, our guide, for pushing us relentlessly so we could go all the way and make it back on time to board our ship. So beware, that hike is hard, potentially dangerous due to the steepness and slippery parts and everyone should be very aware of that, I highly recommend to wear some hiking shoes. Due to some misunderstanding and a road closure, we were almost one hour late starting our hike. With a time restriction to get back to our cruise ship, we ended up doing it in 5:45 as opposed to the 6-7 hours it would usually take at a more relax pace. The scenery is fantastic, we had a lucky breeze to cool us off and no rain. I didn't give 5 stars because we didn't get much in terms of commentary during the hike, it is not a loop so you come back the same way you went in and our lunch could have been a little more than 2 empenadas per person when you get charged 165 each. It was more a personal achievement for my wife and I than anything else.